A few people over at XDA have already managed to root the new Nook Touch with GlowLight. There are a couple of ongoing threads on the subject: Nook ST GlowLight – ready to root? and New Nook GL rooting. And there are detailed directions for manual rooting at Nookdevs. The process is different than rooting the original Nook Simple Touch because the new Nook runs firmware 1.1.5 and the old runs 1.1.2, plus the GlowLight changes things of course. Right now rooting the Nook Glow is only for those that know their way around Android and ADB. You have to use noogie and a modified uRamdisk and ADB to install everything. I managed to create a backup using noogie so that I can get started rooting my Nook Glow, but manual rooting is still a little over my head at this point. I haven’t used ADB enough to know how everything works so I’m going to wait for the updated TouchNooter package. 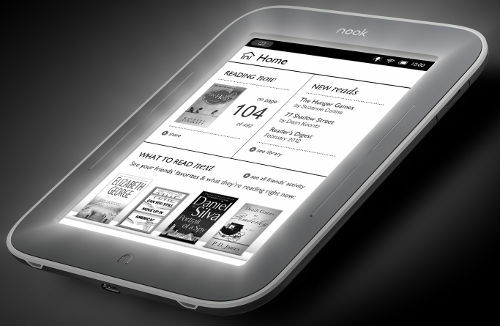 With TouchNooter, rooting will be a piece of cake just like with the Nook Simple Touch. All you have to do is write an image to a microSD card, insert it in the Nook, and power it on and rooting is automatic. I’ll keep my eyes on the threads at XDA and will keep you posted on Nook Glow rooting progress. I will also be posting rooting directions and a video review once I get my Nook Glow rooted. Subscribe to keep in the loop. 10″ Samsung Galaxy Tab 2 Incoming for $399, But Why? Glad I’ve got a Sony because I didn’t understand a word of that article. What is “rooting”? What is Noogie? Isn’t plain English used any more? Well, this a blog about eReaders. Basically, it’s a technology blog. Why would you be surprised at a technology blog using technology lingo? – rooting is the process to gain full root access to the operating system, it is a Unix-Term, root being in this context the Supervisor or Administrator. You do that to tweak the reader and run programs which where not on the reader before. The Sony PRS-T1, Kindle and Nook have all been rooted and run a version of Linux called Android. Although the e-Ink display on dedicated e-Readers are slow, you may be able to access the shop (google play and other shops) and install and test software you are not able to run otherwise. Everything not depending on a fast display has a good chance to run, like other reader software (Kindle on Sony, Kobo etc.). Noogie is probably a program to root the Nook, but that is only an educated guess. Depending on what Sony you have and what firmware is installed, you may be able to root the Sony. The PRS-T1 runs Android, 2.2, but it is possible to install Google Shop, Terminal etc. after rooting. Firmware-Update is still possible, but after every update the root must be applied new – the last time I did not bother. once the nook glowlight is rooted is it possible to load apps (not just media) onto the microsd card? it appears that it has roughly 1 GB of available internal memory (at least before the rooting). am thinking that it might be useful to store the apps on the external card rather than the internal memory. Unfortunately the Prime (or is it just Honeycomb and Ice Cream Sandwich) doesn’t allow apps to be stored on an external card. Hoping that somehow I can load apps onto the card AND have the Touch access & use them. if I want to buy a nook and root it, Shall I wait until the new root method comes…? Isn’t there any other root methods available which ADB is not required in it…? This is an old post I hardly remember. Here’s the link to the GlowLight Nook’s rooting directions, no ADB required. And is this compatible with firmware 1.1.5 which new nooks have…? another Q. I have is: what is “glowworm”? is it another name for “NST Glow” ? Yep. Mine is running 1.1.5 too. Some folks call the device Glowworm.